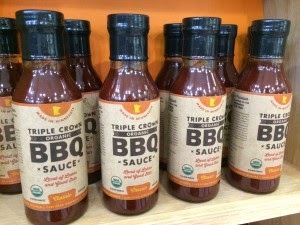 Minnesota based, Triple Crown BBQ Sauce, started in the home kitchen of Richard Schaaf in the early 90s. Richard entered his home brewed sauce in the Minnesota State Fair on several occasions where it won multiple blue ribbons. Word of Richard's sauce spread quickly until the market demanded that the sauce be sold commercially. In 2009, Triple Crown hit the shelves of local markets. 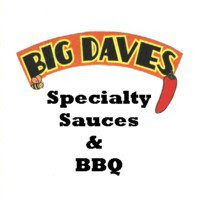 In 2012, the sauce and brand were acquired by Andy Wright who made some tweaks / upgrades to both the recipe and packaging. Even more recently the sauce became USDA certified organic making Triple Crown only the second organic BBQ sauce that I've reviewed. Triple Crown's packaging is stylish and appealing. It's definitely tailored to the organic / hipster market. The slender, 12 oz bottles fall right in line with the aesthetics commonly seen in Whole Foods and other organic markets. This alone, makes it a standout among most sauces. Thick, sweet and smokey are the three defining adjectives for describing Triple Crown BBQ Sauce. One taste leaves little doubt as to it's region of origin. This is a Midwestern sauce to the core. It's the type of sauce that I grew up with. What sets Triple Crown apart from other common tomato based sauces is the ingredient list. Thick, organic tomato puree is sweetened intensely with pure cane sugar and given depth with savory ingredients like salt, garlic, and chili pepper. They then go the extra mile to enhance the flavor with exotic spices like tamarind and allspice. Natural hickory flavor (liquid smoke) is also very evident in the flavor and aroma. With ribs on the menu, I chose Triple Crown BBQ Sauce to give two racks of meaty spares a sweet, sticky finish. After smoking the ribs for 5 hours, I applied Triple Crown liberally and grilled each rack for a couple minutes per side. As with any sweet sauce, I took care not to allow the hot flames too much contact with the ribs to prevent burning. Thanks to Triple Crown, my ribs were a tantalizing ruby red. I probably should have heated the sauce a bit before applying it to get a smoother, more glossy finish. Even without doing so, the ribs were still beautiful. Better yet, the ribs' taste surpassed their appearance. The sweet, smokey profile was just what I was looking for with those ribs. Triple Crown has all the components of a top notch tomato BBQ sauce. Thanks to the extra attention and care given to each of those components, Triple Crown separates itself from familiar favorites. Organic sauces are few and far between. I'm thankful for another tasty option. It's the type of sauce that you can serve to a crowd...especially a health conscious crowd. Featured primarily in Minnesota and Wisconsin markets, Triple Crown can also be purchased online through Amazon and Yumzar. Check out their website for additional information about Triple Crown. 0 Response to "Triple Crown Organic BBQ Sauce"